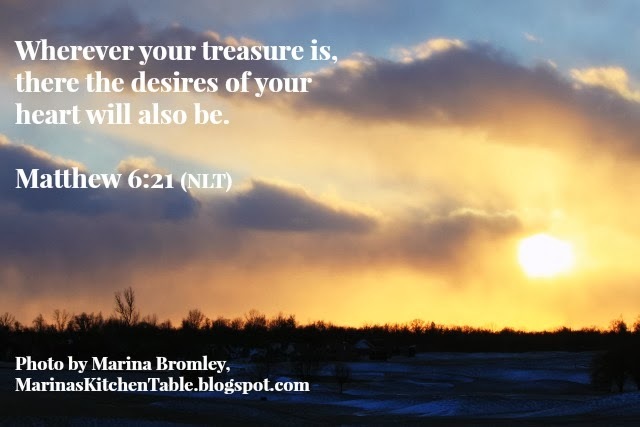 Marina's Kitchen Table: Word Wednesday....errrrr THURSDAY... On Tithing, Generosity, and a prayer! Word Wednesday....errrrr THURSDAY... On Tithing, Generosity, and a prayer! I hate it when I misplace days. Does that happen to you? I knew all day Tuesday, that it WAS indeed Tuesday, but somehow when I woke up Wednesday I thought it was Tuesday all over again! UGH. These stupid antihistamines... It's a wonder I can think at all!! I'm grateful that despite those days I'd love a do-over, God keeps us moving forward... or rather, with all the snow and ice around here... PLOWING forward! He's so gracious to give us all things in it's proper season. God is SO good to give. He is a GIVING God! I love to read about the giving that goes on over at The Generous City, hearing stories of people blessing others. Mark and I try to make it a priority to live generously, and it's always exciting to hear of new ways that others are being led by God to live that out in their lives. Goodness... is there not a more compelling reason to be generous than that? while another hoards more than is right and still has need. and someone who gives water will also receive the water he needs. Giving can look very different to each person, both in our financial resources - how much God has GIVEN US to give, and in our convictions - how God is TELLING US to give to others. In our married life, we have lived lean, out of necessity. Early in our marriage I remember a few years that we were blessed by our church, as they helped us by paying for diapers and formula while Mark was staying at home with our daughter as he recovered from a work injury, and I went off to work every day. I don't ever forget the generosity of the body of Christ around us! IF we went out on a date, my dear sister or a close friend would babysit, and sometimes give us $5 to pay for the date!! It paid for the coupon special - .25 cent hot dogs at the Der Weinerschnitzel around the corner from our house, and a few rounds of video games at the local arcade. That was it! But we learned to be content with our circumstances, and learned that others' generosity blessed us greatly. Those times we had nothing, we learned to depend on God for our every need, and He provided for us... and more! Another period of time in our marriage (more than one year) we lived paycheck to paycheck. If the kids got sick it was charged to a credit card. Vacations were limited to driving to visit family members who gladly helped pay for gas, and let us stay with them in their homes (which might not feel like much of a vacation... but still, I was - and still am - VERY grateful to have experienced a change of scenery). Living lean can be hard in our culture today. There's so much pressure to have all the games, bells, whistles - whether it's electronics, cars, clothes or homes. It takes great discipline to live lean, and set aside our wants for God's needs. And when we don't have money to assist others, we can still give a tithe offering to our church, and give time and talents to honor God in other ways... helping a woman who is broken down on the side of the road... buying a few burgers for the man out in the cold... or other random acts of kindness by opening doors and helping carry groceries, or shovel driveways, or offer a drink on a hot day. We can tithe the actions of our hands and feet, the words of our mouth! Perhaps we have gifts that can bless the body of Christ, and we can serve in the church or community as a volunteer (which, by the way, is a great way to build your resume during times of unemployment... keeping your professional skills in tact and showing that you have what it takes to be resourceful). I believe God allows some of us to go through seasons of RECEIVING, to make us better at GIVING. I don't think that the amount He gives us has much to do with it... it ALL belongs to Him, and we are all blessed by giving in generosity to honor His Name. Which, I think, says it all... to keep our attitudes, our priorities, our activities, all pointing heavenward... from our hearts to His. Father, I ask that You will make me generous, financially, in mercy, and forgiveness. Help me to see ways around me that I can be a blessing to others, with my seasons of much and my season's of need. I pray that You will show me creative ways to bless others, giving from my heart to please You alone, not man or woman, just You. I ask You God, that You will give freely through me, to bless Your work in my church, in my home, in my neighborhood, my community and my world around me. Give me a passion for those organizations that You have ordained to be Your hands and feet, to carry Your Good News to the Nations, and in my back yard. Give me Your eyes, and Your heart, to help those around me. Turn my world upside down, to bless You and give You glory. In Jesus' Name... amen.